Next up on my “to scrap” pile is this image of my grandson looking at his snow-crusted mitten. 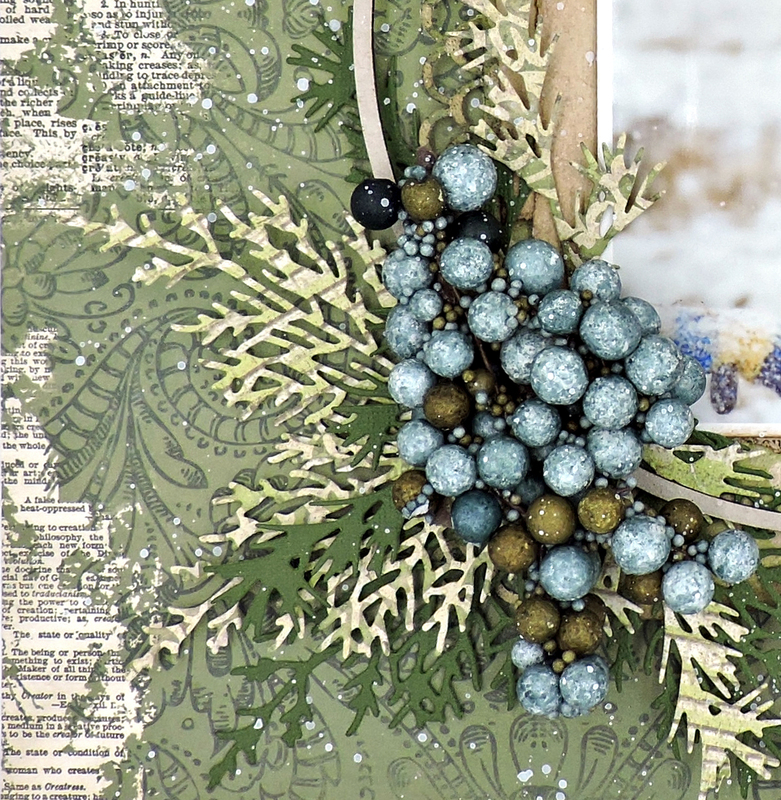 I cut a piece the FabScraps Stripe paper to fit under my photo and punched the edges here and there. Next, I tore a couple of book pages to form another layer. After inking them heavily, I crushed the pattern paper into a ball, flattened it out and taped it to a bit of packaging before adhering it to the Bo Bunny sheet. I glued the book pages in place (I like using glue here; it gives me the chance to adjust the paper to “just right”. ), then adhered the photo that had been backed with another piece of packaging. 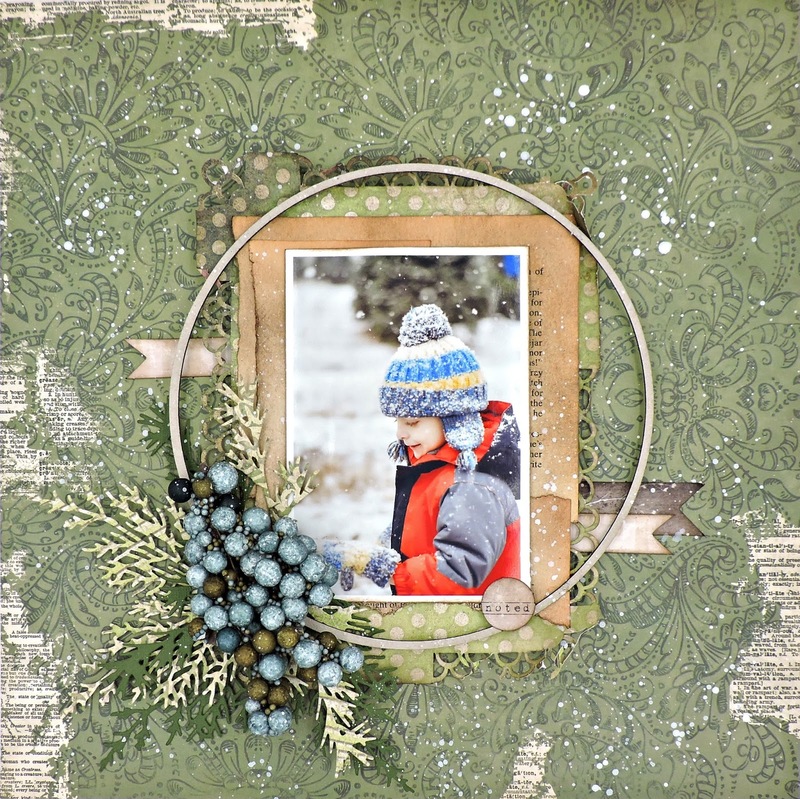 I framed it all with a bare chippie – simply a circle left from a Blue Fern Studios package. 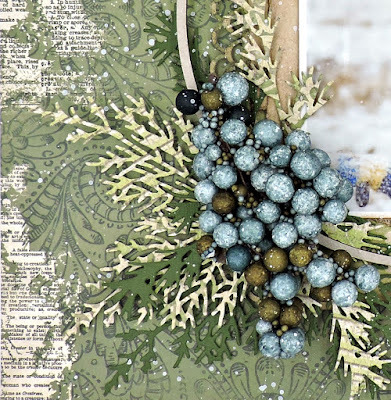 The branches were die cut from a mix of FabScraps Reed and Core’dinations cardstock. I topped them with some berries that I’ve had for years. I’ve added a few bits of 7 Dots Elements to give a bit of interest: the banners and the circle, all inked to give them an aged look. To finish it off, I covered my photo and splattered my layout with watered-down gesso. A big, big thanks to my wonderful Daughter-In-Law for the photo of her Little Guy.